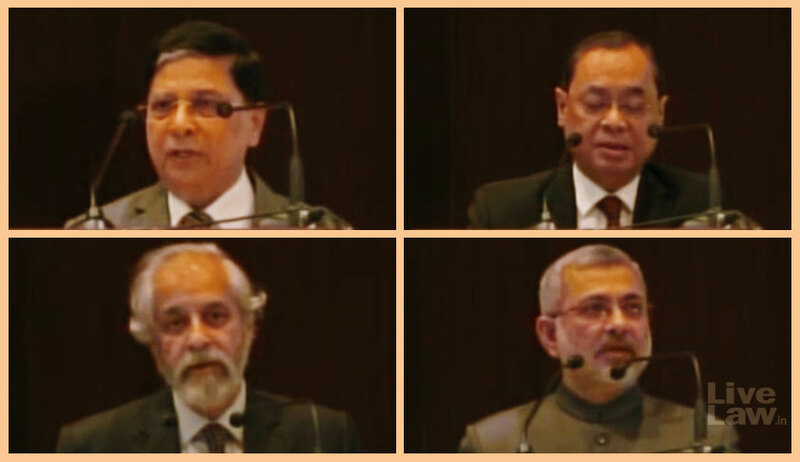 Chief Justice Dipak Misra on Friday declared that a “warfare with a mindset” is to be fought against the mounting pendency, which threatens to defeat the access to justice. He was delivering the inaugural address at the Conference on ‘National Initiative to Reduce Pendency and Delay in Judicial System’. Noting that each matter has a definite lifespan, he urged that all cases which have not been finally disposed off not be blindly regarded as “arrears”. He spoke of the communication he addressed to the High Courts, recommending the establishment of a disposal review mechanism to meet periodically, examine the patterns of pendency and effect allocations to appropriate judges for disposal. He mentioned that the Chief Justices of all High Courts have been urged to explore the possibility of hearing on Saturdays Criminal Appeals and Jail Appeals which have been pending for over 10 years and those in which Legal Aid Counsel, paid remuneration by the courts, have been appointed. Further, in May, the High Courts were requested to consider hearing Criminal Appeals during the Summer Vacation in which the convict has been in Jail for 5 years or more, of course, after obtaining the consent of counsel of both the parties. The information which has been received so far reflects that around 240 cases have been decided during the summer vacation in May-June. He fastened an obligation on the executive to assist in the service of processes by Courts, canvassed the scope of plea bargaining and Alternative Dispute Resolution and criticised the trend of seeking adjournments as a “disorder”. It was the Chief Justice’s opinion that think-tanks comprising judges, advocates and academicians set up by High Courts would go a long way in innovating new ways of tackling the arrears in litigation. He suggested a deft approach to control the avalanche of litigation and the docket of pending cases. 1. Time Limit to dispose of technical pleas by all courts. 2. Mechanism to monitor progress of cases from filing till disposal, categorise cases on the basis of urgency and priority and also grouping of cases. 3. Set annual targets and action plans for subordinate judiciary and High Courts to dispose of old cases and maintain a bi-monthly or quarterly performance review to ensure transparency and accountability. 5. Shortage of Judges is no doubt a factor responsible for pendency but at the same time, it is found that some courts have been functioning and performing better in the same conditions. Adopt such courts as models. 6. Modernisation, computerization and technology – court automation systems, e-courts, digitization of court records, access to information about cases. 7. Strive for more alternative methods of dispute resolution in various forms like arbitration, mediation,pre-litigation mediation, negotiation, lok adalats, well-structured and channelized plea bargaining, etc. 8. Committes at the high court level have to be proactive and functional committees. They should meet at least once a fortnight and keep their surveys and reports in digitized format. 9. Frame strict guidelines for grant of adjournments especially at the trial stage, also stricter timelines for cases, not permitting dilution of time frames specified in CPC for procedural steps in the civil proceedings. 10. Explore options of Saturday Courts for cases other than criminal appeals. 11. Consider and explore options for setting up fast track courts and fixing time limits or deadlines for certain categories of cases especially in subordinate courts. Justice Kurian Joseph suggested that the age of retirement of judges at all levels of the judiciary be increased to 70 years. He advanced that there be no disparity in retirement ages of the judges of the apex court, the High Courts as well as the subordinate judiciary. Justice Madan B. Lokur suggested that the emphasis should be on reducing arrears in the district judiciary, considering the sheer quantum of cases lying pending, coupled with the alarming number of vacancies and the poor infrastructure. In his turn, Justice Ranjan Gogoi spoke about employing artificial intelligence towards the ends of court management. In a fashion not unlike the separation of the chaff from the grains, he observed that the more consequential matters be identified and accorded priority over others in the face of acute scarcity of judicial time. In view of the gaping shortage of judicial officers in the country, the second senior most judge of the Supreme Court recommended that the trial length of matters be reduced, the time spent on procedural issues such as summons and recording of evidence be checked, so that judicial energy is conserved and directed at the more productive aspects.